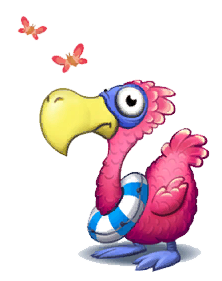 Dozies are uncommon enemies appearing in Donkey Kong Country: Tropical Freeze. They are faced in many areas of the Lost Mangroves, although a flock of Dozies and Sour Dodos can be spotted relaxing on a small isle in the background of Mangrove Cove. Dozies resemble small, purple dodo birds that don a swim tube around their necks. Their head plumage, as well as their wing and rear plumage, is composed of feathers with orange-colored edges. They also have indigo-colored feet. Dozies are generic enemies that do not actively attack the Kongs. They only walk back and forth, but peck and injure the Kongs upon simply bumping with them, draining one of their heart points. The player can defeat a Dozy using any means of attack, such as a jump, a roll attack, or an object throw. A ground pound can stun them for a brief moment if the Kongs stand close enough to them. They can also be stunned if shot by Diddy, Dixie, or Cranky's popguns. Dozies can be compared to Awks from Donkey Kong Country Returns. They have a rasher counterpart called the Sour Dodo. This page was last edited on April 4, 2019, at 14:33.